Has anyone else noticed something about kids lately? Whether we’re at the mall, at the park, or doing our weekly grocery shopping, we’re seeing more and more kids talking on cell phones. This doesn’t just mean teenagers; we’re talking about 8- to-14-year-old kids. Heck, we’ve even seen some really young kids, five years old maybe, talking away like it was their birthright to do so. Clearly this is a bit of culture shock for us, who only knew one kid at the age of 14 who had a cell phone. It was big and clunky and the battery life was so bad that you couldn’t keep it on unless you needed it. Now 14-year-olds have the latest technology. This brings a number of questions to mind, but this one sticks out: How do we best handle younger and younger kids using cell phones? We’ve long said that young kids don’t need cell phones. Maybe we’re biased; maybe we feel that since we grew up without a cell phone, kids today shouldn’t have them. Regardless, though, nothing we say is going to change the current trend. Kids are going to have phones, so we might as well figure out how to make the best use of them. 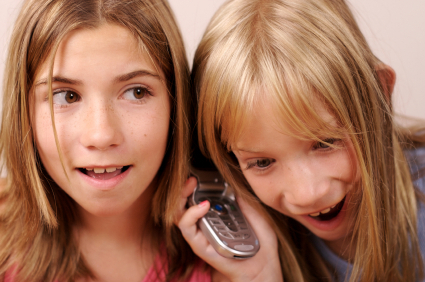 Enter kajeet, a pay-as-you-go cell phone service that is aimed directly at kids. The company was founded in 2003 by Daniel Neal, Matt Baker, and Ben Weintraub as they sought a way to empower their children with cell phones, but ultimately keep the parent in control. After years of research and market testing, kajeet — which is an anagram of the first letters of the founders’ children’s names — went live in 2007, and opened to much praise. Their slogan, “Use it for good,” espouses two ideas behind which the company was founded: “We believe kids are smart,” and “having a cell phone is not just fun, it’s a responsibility.” We’re glad kajeet feels this way, because they hit it right on the head. Tweens are their main market, meaning kids between the ages of 8 and 14. This is a risky time to hand a kid something like a cell phone. Dramatic changes occur to kids at these ages. You can’t just hand them something like a cell phone and expect everything to run smoothly. There has to be an agreement between parents and child. Fortunately, kajeet believes in that agreement. Kajeet is very clear about their pricing models. “We found that the market was interested in a very clear pricing plan, and that’s what we stick to,” says Daniel Neal, founder and CEO of kajeet. Clear it is: 10 cents per minute for calls, any time, anywhere. There are no roaming charges, because a kajeet phone will not function in roaming mode. “The coverage in our target areas is excellent,” says Neal. “Kids aren’t business travelers who might find themselves in areas of no service.” Text messages are just five cents each, which among the lowest in the industry. Funds are loaded into a kajeet “wallet,” which acts as the account balance. Beyond calls and texts, wallet money can be used to download ringtones and games, which vary in price. “If a kid’s Kajeet allowance is $20 a month and he blows it all on an Ice Age 2 game, Beyonce wallpaper and a few ringtones, he won’t be able to text or phone anyone — except his parents and 911, which are never blocked,” says mother Wendy Cole in an article for TIME Magazine. This should teach kids a lesson in budgeting, a skill not realized by many youngsters. This doesn’t come without a catch, though. There is a 35 cents per day access fee. In the past, we’ve railed against access fees, noting that they’re rarely worth what amounts to a minimum monthly charge. Mr. Neal elaborates on kajeet’s 35 cents per day charge by explaining that it covers services like the kajeet Navigator, the kajeet Configurator (which we’ll discuss shortly), and other features like Google Maps. The best part about kajeet is that it is a true pay-as-you-go, meaning there are no contracts to sign and no commitments to make. Because we all know what a burden contracts can be. Their selection of phones may seem thin at first, but remember, this is a company that just launched in March of 2007. They selected their initial run of phones carefully, keeping them affordable yet technologically ahead of the curve. The prices currently range from $49 to $99, with the Sanyo Katana being the highest end model. 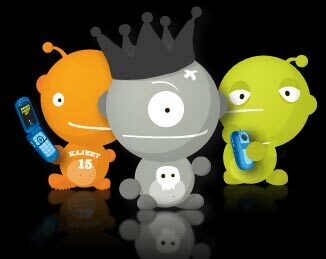 Perhaps it’s not that there is an existing market for higher end phones for kids, but it’s that kajeet is creating such a market. “The main premise of the business is that our customers are smarter and more sophisticated than people give them credit for…they can use phones more advanced than their parents can.” Depending on market reaction, kajeet could very well see some top-of-the-line phones in the coming months. In our obligatory Arnold Schwarzenegger reference: Hasta la vista, cell phone abuse. Kajeet has the Configurator, and it’s only goal is to allow parents to make sure their kids are using cell phones responsibly. How so? Well, let’s take a look. Displayed above is the time manager, which is quite the ingenious feature. With it, parents can regulate which times their children can use the phone. Want your kid in bed by 10 p.m.? Block all calls after that time. Don’t want him or her text messaging friends during school hours? Shut it off during those hours. Have designated study hours in your house? No longer will your kids be distracted by the cell phone. For the target demographic, this might be the No. 1 reason to get kajeet. The Configurator has other options too, like a contact manager, which allows parents to decide who can and can’t call and text your phone — and vice versa. Also, it allows parents to set from whose wallet the call deducts. For instance, all calls to and from home might come out of the parents’ wallet, but calls to Eddie Haskill come out of the kid’s. Furthermore, parents can check the account activity to make sure they’re not wasting their money on excessive ringtones and games. Parents can also block features they don’t want their kid using. The Configurator is also one of the many places parents can refill the account balance. One feature slated for introduction in the not so distant future is GPS location technology. All new phones are equipped with GPS devices, which are mostly used for directional assistance. However, there is an added power for parents: They can have the peace of mind of knowing where their kids are. This is, of course, a bit controversial; should parents be allowed to perpetually spy on their kids? “The market is still digesting location technology,” says Neal. “We’re not rushing into the market with it. There is a demand, and we want to give our customers the most choices. We’ll do it very carefully, very soberly, while considering customer feedback.” It’s a slippery slope, and it appears kajeet is doing its best to balance both ends of the beam. There are other uses for the Series B funding beyond handsets. Specifically, Neal and his team are looking to “expand marketing and expand our distribution channels.” If you haven’t seen a kajeet ad on TV, though, don’t worry; you’re not alone. They’ve had four years to decide how to market the product, and what they’ve come up with is little short of genius. We’ve long protested commercials as useless interruptions; we’re more apt to be contemptuous of a product because we saw its commercial than we are to buy it. It’s different with kids, though. They watch more TV than the average adult, so television advertising still makes sense for them. For its TV outlets, kajeet chose Nickelodeon and Cartoon Network. Their first commercial can be found here, and once you view it you can see what they’re getting at. However, we asked Mr. Neal why we had never seen a kajeet ad on any of our channels. Surely they want to market to parents as well as kids, right? As parents, we are constantly “pitched” by companies and brands that promote the idea that they want to “help kids” or help families. Kajeet and Daniel Neal ACTUALLY mean it. Seriously, I was blown away but the conversation with Daniel Neal about the company and how he and his team developed it. Daniel is a father of “tweens” and so are the other founders. They created Kajeet and the services that go with it as PARENTS—-then they decided to sell it. I am telling everyone who will listen what I think of this company and how much credibility this brand has with me. Now that we think about it, we don’t have kids. The only channels we watch that would market to parents are our sports programs. And, to be honest, the last thing dad’s thinking about while watching two teams beat the crap out of each other is his kid’s cell phone. So kudos to kajeet for understanding the workings of the market and how to best penetrate it. A study was released last week regarding the effect of cell phone use on brain function. While the finding was that any cell phone effect on brain function was negligible, there was a warning attached regarding the use of cell phones by children. There simply isn’t enough data available to make a real assessment of a cell phone’s effect on a child’s undeveloped mind. One of the advantages to having four years of research and testing is that you can address issues like this head-on. Daniel Neal knew of this issue, and since he has children of his own, wanted to make sure that he wasn’t putting his or other kids at undue risk. To Neal, it boils down this. There is no scientific data that makes any connection to cell phone usage and decreased brain function, whether in a child or adult. He does concede, though, that there are many places where data simply does not exist. But where it can be found, there is nothing harmful. However, that’s the really the point. And kajeet recognizes parental concerns. They’ve taken measures to reduce any possible risk involved with kids using cell phones. For instance, all phones are shipped with ear buds, so that the phone itself need not be pressed against a child’s ear. “We looked for and utilize speakerphones,” said Neal, noting that kids of that age like to share their conversations with the speakerphone. “We want to be the ones to do it right,” he says. “At the end of the day, we are not a cell phone company,” says Neal. “We are a computer company that connects through networks.” If our experience with the company and our conversation with Mr. Neal is any indication, they do a good job with connecting people. Indeed, kajeet has a leg up on the competition. They’ve had plenty of time to do their homework, and it shows in the product and service. Brainwash them early and make them happy consumers. Kids have got to learn that ‘want’ and ‘need’ are the same word. I love that there is no contract for this service. Parents can try it out and see if it suits their needs and the needs of their young ones. Time management tools for the parents are a great idea, as well as the thought of giving the kids decent hardware. The unit itself appears flimsy. The use of my debit info has been abused with no compensation. need I say more? I think I’ll stick with Sprint. Kajeet recently canned 40% of its staff. I saw a group of them celebrating their boss and peers being let go over champagne. Stupid, your next. Be careful if you bought one, insiders say they’ll fold in 3-6 months and you’ll be stuck with a non-working phone and prepaid card!!! Jean: It was more like 15%, not 40%, and for the most part, those laid off were excess dead weight. The boss being celebrated was the ex-CMO, and his departure is a big step in the right direction for kajeet, imho. Don’t count these guys out by a longshot. I think kajeet will do extremely well with the “tween” market. However, I believe most parents of this age group would be interested in having a GPS feature to know where their child is at any given time. I have read all the articles about the “privacy” concerns the founders have and it being a “slippery slope” but it is ridiculous that a child that age should have “privacy” regarding his whereabouts. This is a security concern that I’m sure every parent has in this day and age. I really hope they reconsider and other parents speak out. and they will keep giving you the runaround because customer care says they dont work directly for kajeet??? Kajeet phones do have GPS that parents can check on their kids’ whereabouts with. Kajeet has been promising me a rebate check for 6 months! don’t use this company!!! My daughter has a phone through you. Her grandma was the one that set it up for her. We do not talk to grandma now. I was wondering how I could put minutes on her phone without knowing how grandma set it up? I have had a Kajeet phone for two months now, and the time manager and parental controls will not work. I have spent 12 hours in 7-8 phone calls in the last 2 months, always being promised a non existant call back. Still waiting. Horrible customer care! Do not fall for this, I haven’t cancelled since I spent a fortune on a phone…………..Now I”m stuck! I am an employee here at kajeet (not customer service) and I really want to help you resolve this issue. I am very sorry for the inconvenience this has caused you and the wasted time on the phone but I will do my best to make this right! If you could, please email me your account details and your specific issue. My email address is rmcburney@kajeet.com. Thanks Angie!